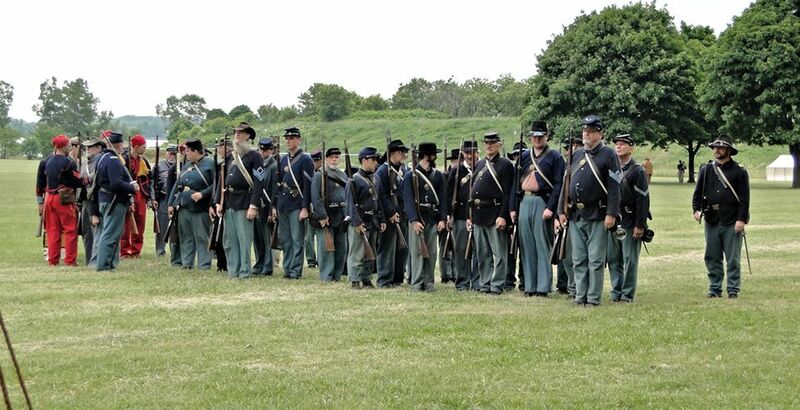 I would like to think it is the goal of all reenactors of any period they represent in time to do their "maximum utmost" to be as accurate as they possibly can, to show the past as it was to the best of their ability. 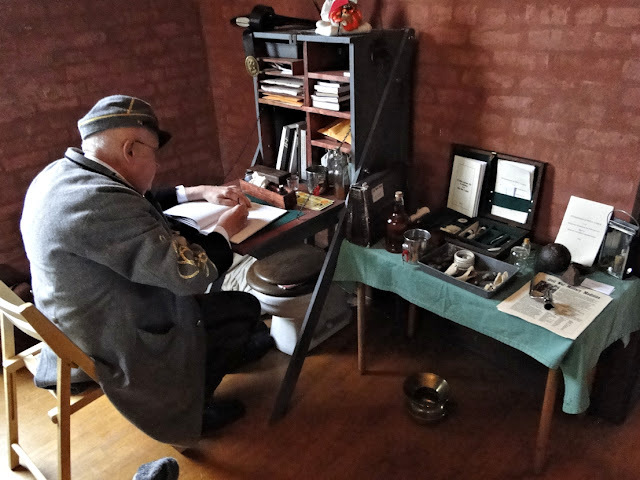 Aside from a few who may not care to be accurate (and I believe most of these exceptions know who they are), I believe nearly everyone who participates in the living history hobby certainly does make their best effort. President Lincoln with my son, Robert. 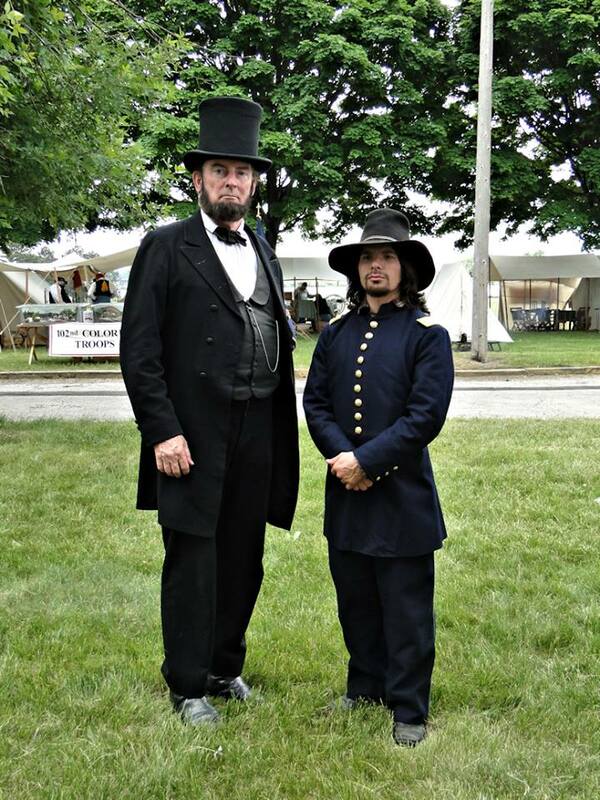 Rob is the Military Commander of the 21st Michigan. the world of living history. you will feel as if he were the real deal. We are proud to have him in the 21st Michigan as well. 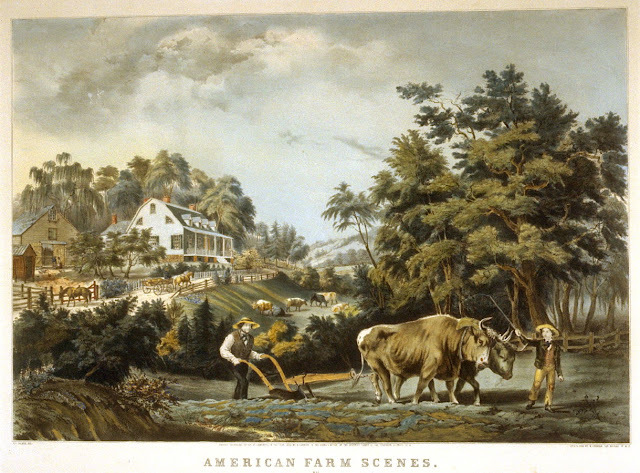 I like to tell people that we don't need to be carte de visite perfect, but, rather, Currier & Ives perfect, for C&I colored paintings/prints, in my humble opinion, are actually a better representation of what life really looked like in the mid-19th century. Now, before you get your dander up against me, all I am saying is Currier & Ives makes the past come alive vividly and can be used for clothing fashions and daily life activities, for they were contemporary prints of their day. 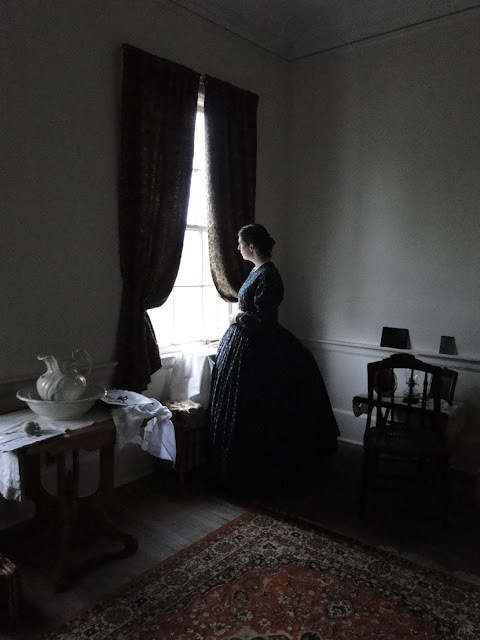 This is where one can see, in color, a farmer plowing or haying, or a woman cooking or working in her kitchen garden while wearing their work clothes. And that's why I love Currier & Ives prints so much, for they depict actions of everyday life that the camera of the time could not, or, rather, did not very often. What's more American than farming...plowing...? 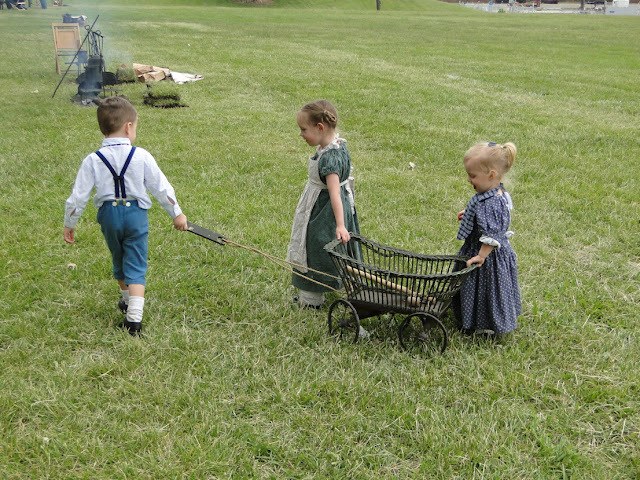 And we, as reenactors, can and should show the public the depictions of mid-19th century America. 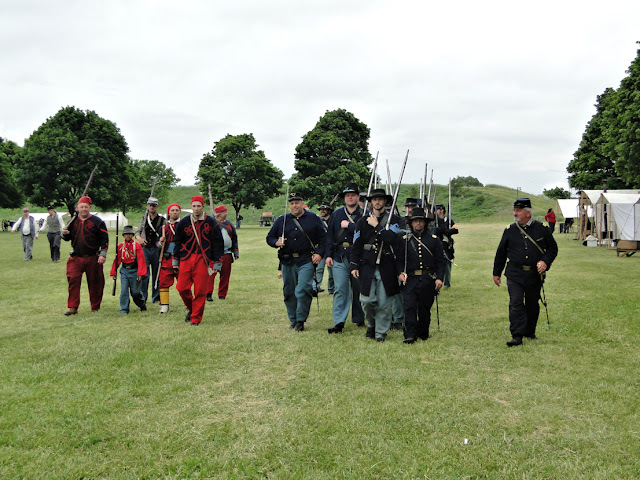 Which brings us to the reenactment at Detroit's Historic Fort Wayne - an actual fort. 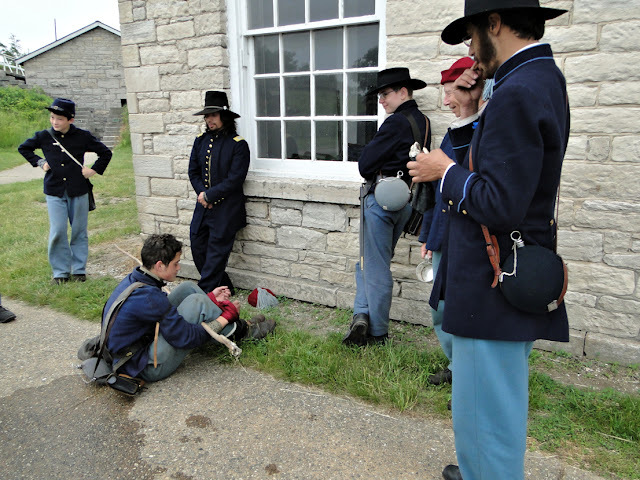 And now we, as reenactors, get to 'play' in the very same buildings on the very same grounds as did the actual soldiers of so long ago - from the Civil War through Vietnam. 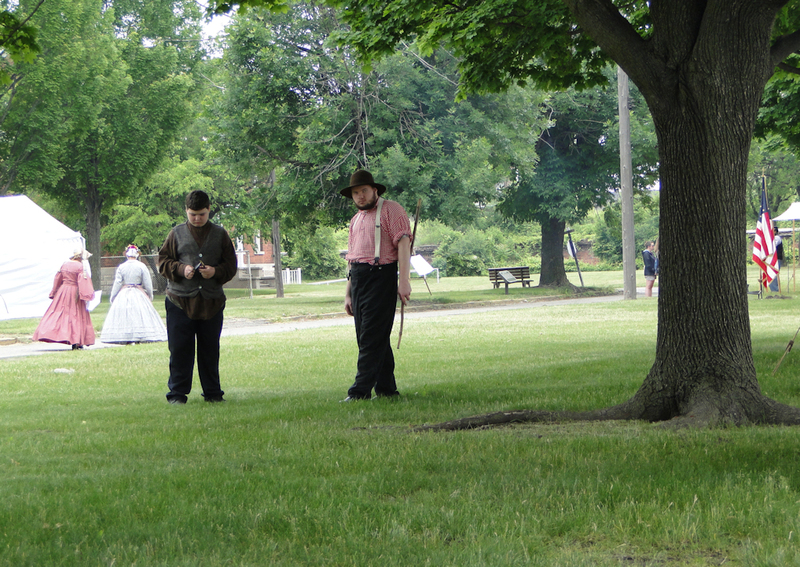 If you would, please join me in pictures to witness our version of the 1860s at Historic Fort Wayne. That's my farm son, Miles, on the right with his pal John Paul. grand old American music of the Civil War era. The 5th Michigan Regiment Band was one of the many highlights of the reenactment, and they drew a goodly crowd to watch and listen. Children of reenactors spend their weekends playing simple imagination games, keeping themselves busy and going non-stop without the use of electronics to hold their interests. 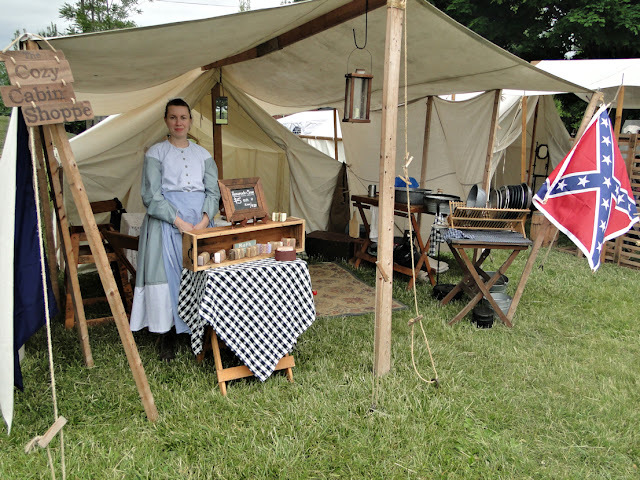 Theresa Suave' is the proprietress of the Cozy Cabin Shoppe, and she makes homemade candles and soaps to sell at reenactments. 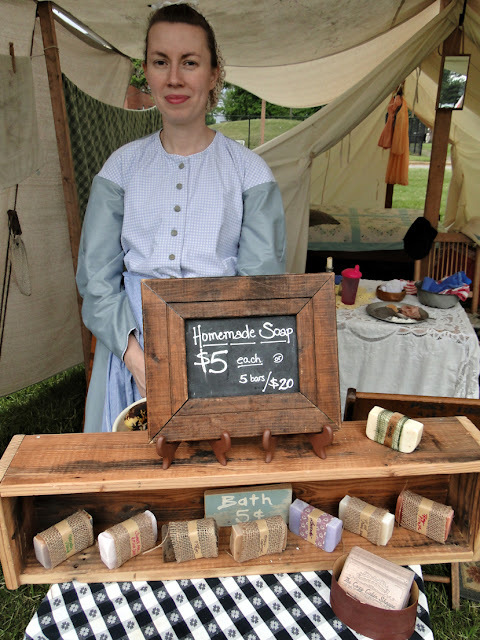 "Homemade Lye Soap. Just like the old stuff Grandma used to make. Homemade bar soaps are great ways of staying clean and healthy with GREEN Earth-friendly products. All of our soaps are moisturizing and great for sensitive skin. Some are good for all-over-body use, others designed specifically for face, some are good for your hair, and yet some still just for those work-worn hands of yours." feel free to contact her at the link in the previous photo. 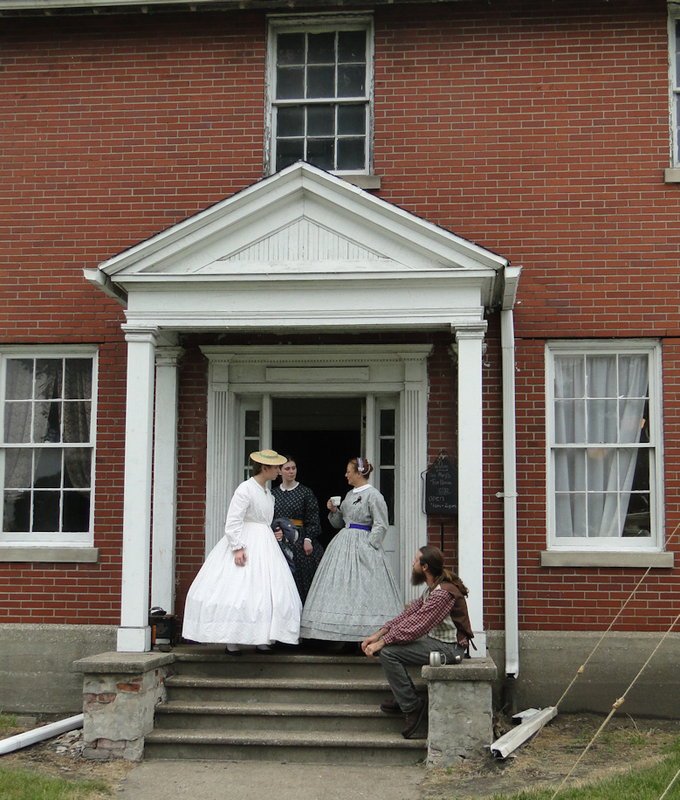 Visitors always stop by to speak with the Assenmachers - Andy & Sue. Their set up is based around a Victorian home, with a kitchen, parlor, and bedroom. Yes, the stove is HOT. 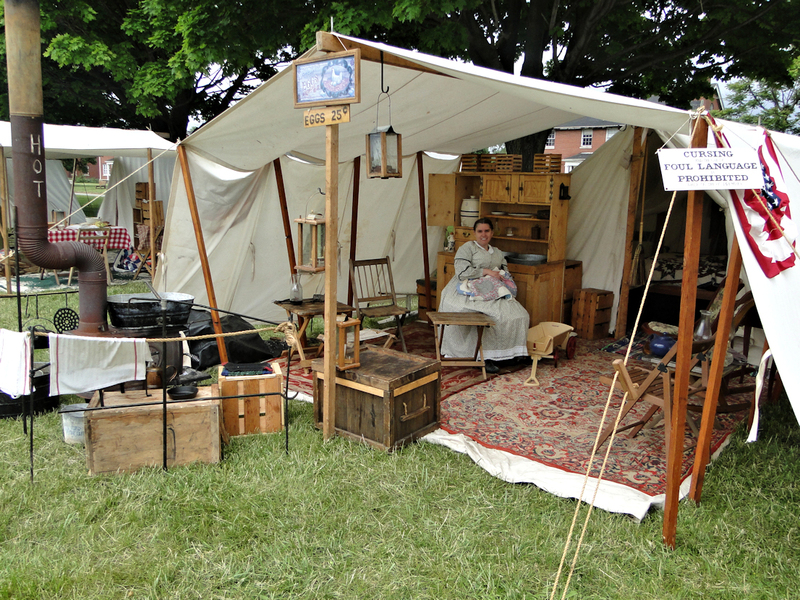 I did not set up my tent at this event, but kind-hearted Christa allowed me to use her tent to set up a couple of chairs. 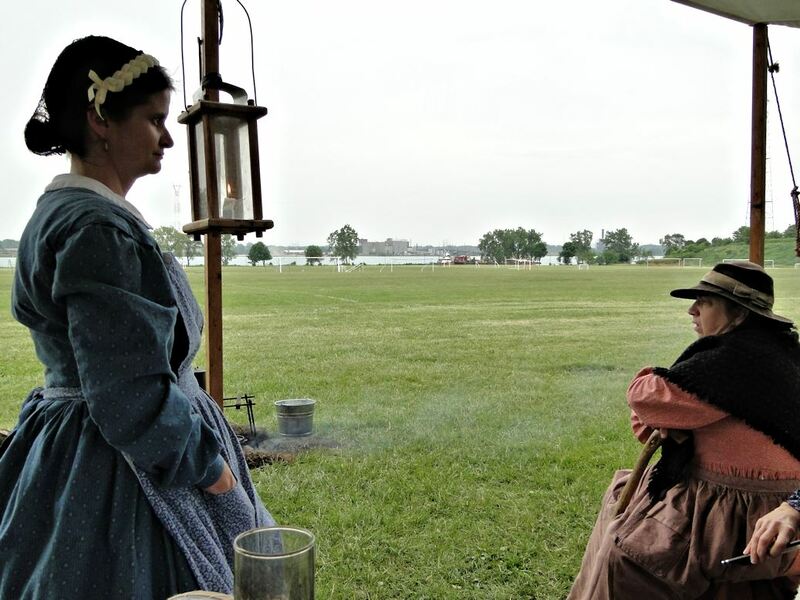 Here you see Christa and Mrs. Cook as they prepare to watch the men on the battlefield. Lovely young ladies entertain an even younger lady in a myriad of ways, including spinning, playing graces, and with hoops. President Lincoln addresses the troops. 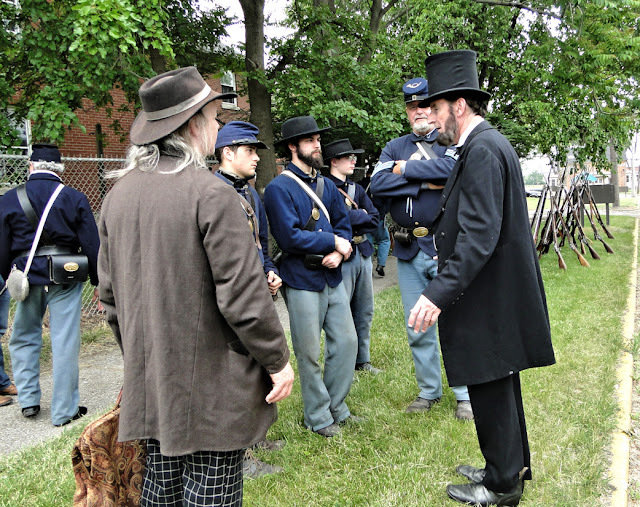 Meeting President Lincoln was an important event for Union soldiers. 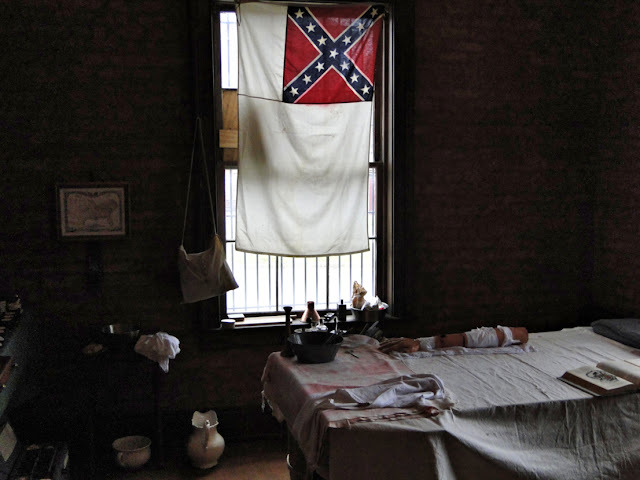 One of the more interesting aspects about the past of any era is learning about the medical practices. 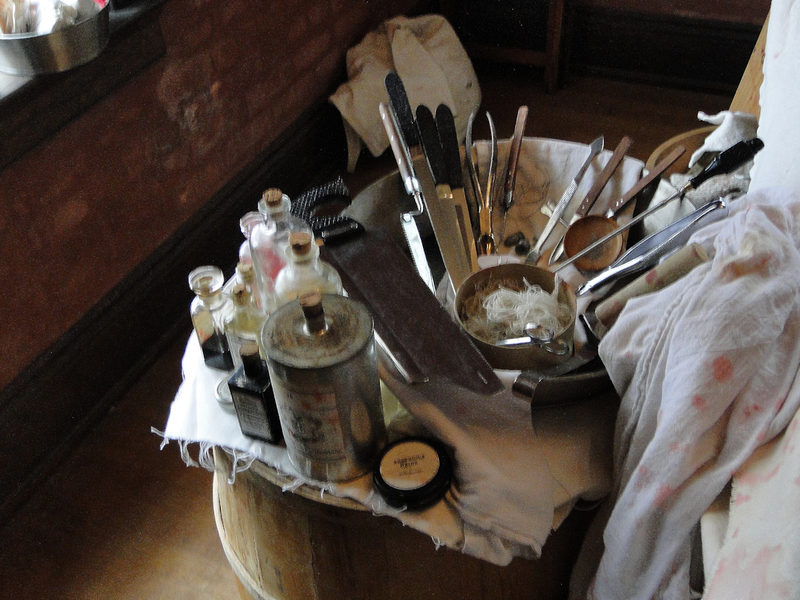 And of the tools of the trade. 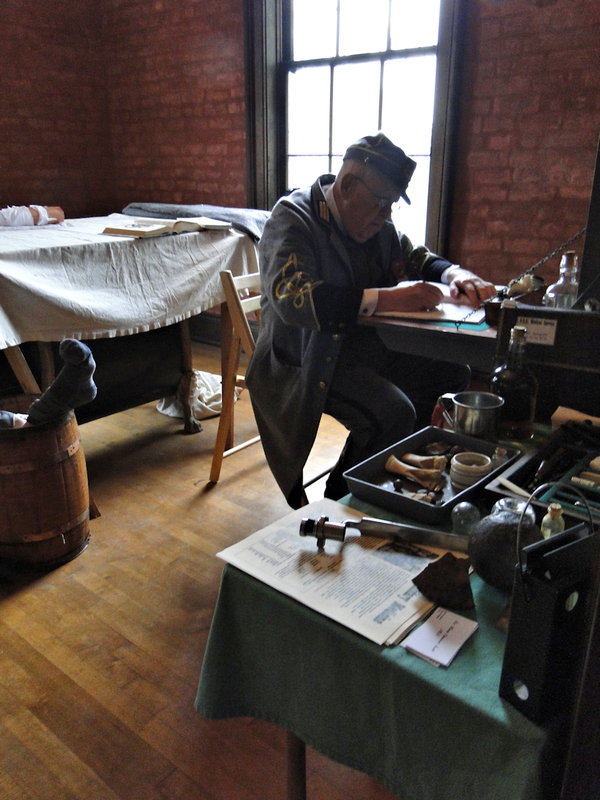 Henry Tripp is one of the more well-known medical living historians in our area and will present not only the Civil War era, but the colonial period as well. Yes, he really does a fine job indeed! Folks, this is the sort of thing that needs to be done more often. civilians from the 21st Michigan show up to really do much. But kudos to the ladies here for the fine job they did. 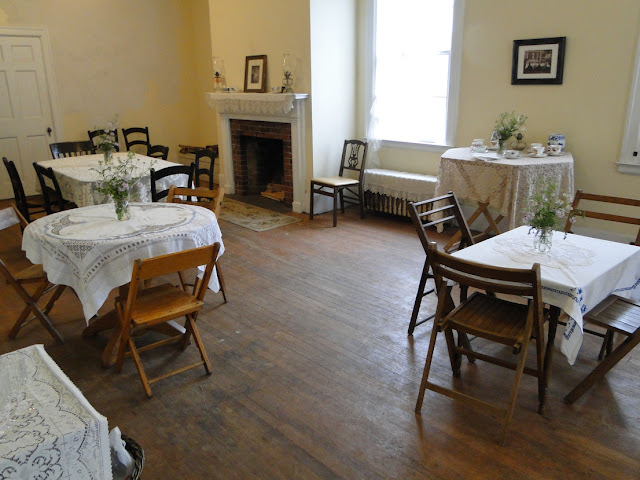 Across the hall from the tea room is the parlor where the ladies can relax before and after business hours. 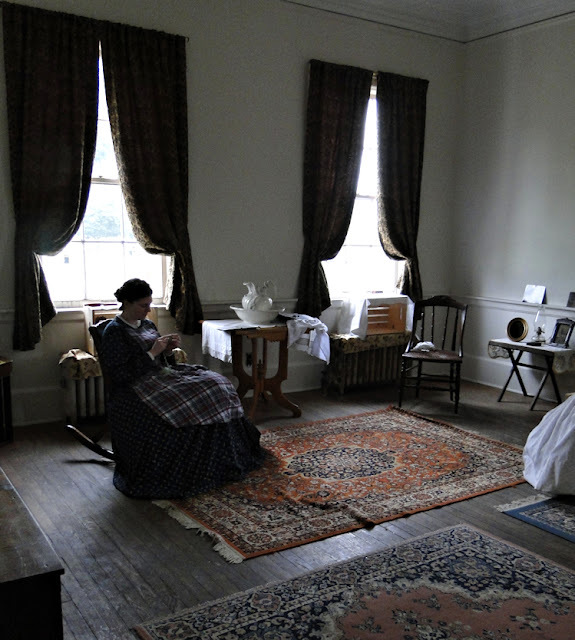 Meet Miranda, a civilian from the 4th Michigan, relaxing in the parlor. 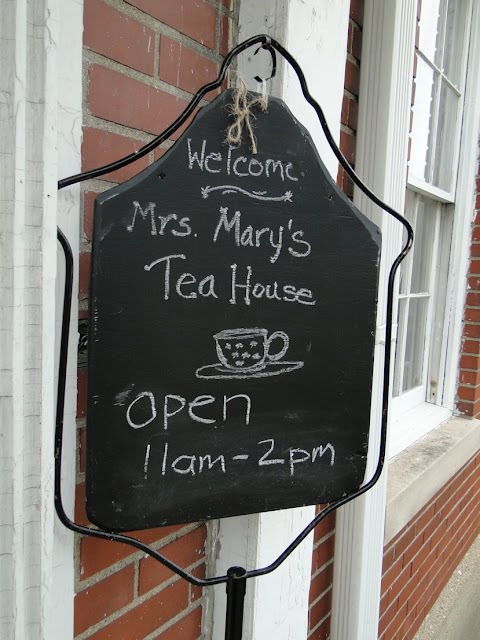 It was while I was visiting that I envisioned this next picture. Miranda was very kind to pose for me here. This is exactly what I saw - no touch-ups needed. "Wait --- stay as you are!" 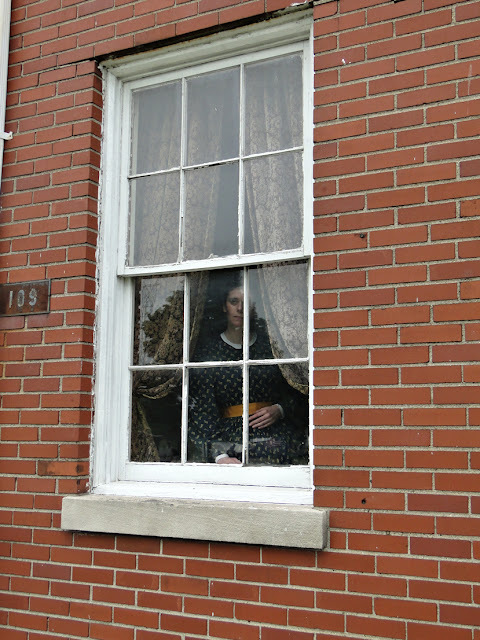 And I scurried outside to get a shot from the window. It almost has an ethereal - ghostly - look to it. 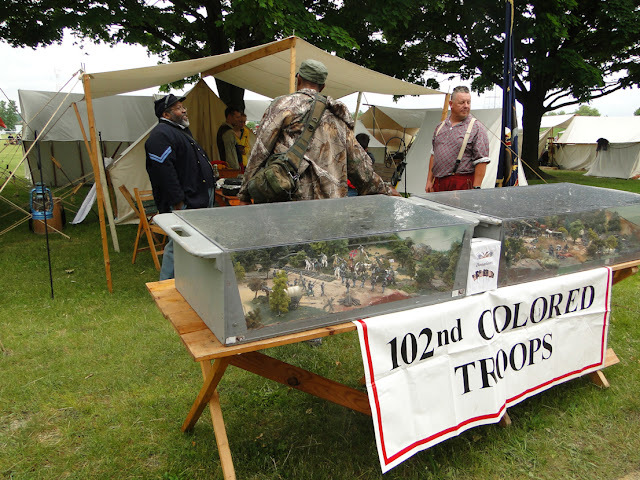 It's always good to see the 102nd US Colored Troops come out to teach about the role of the African-American during the Civil War. These guys spoke to the kids in my history class earlier this year and did such a phenomenal job. They had the kids in the palm of their hand. So if you are ever at a reenactment where the 102nd are, please make sure you check them out. They have much to say. I'm not sure what this soldier did to receive such a punishment, but I suppose it's better than a hanging. From what I was told it was taken from the book "Hard Tack and Coffee" by John Billings, first printed in 1887. There were not as many from the Union that we would have liked, but 'tis not too bad a showing. 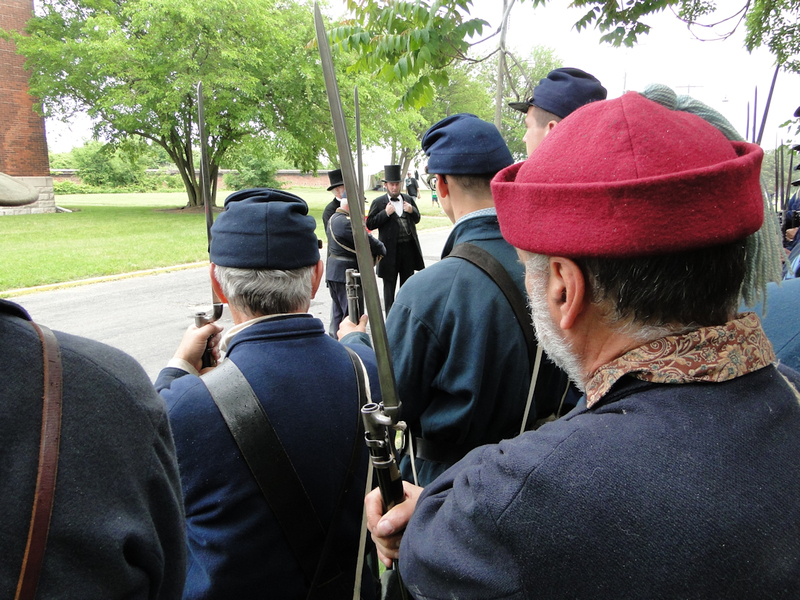 We had even less Confederates take part so on Saturday there was no skirmish. 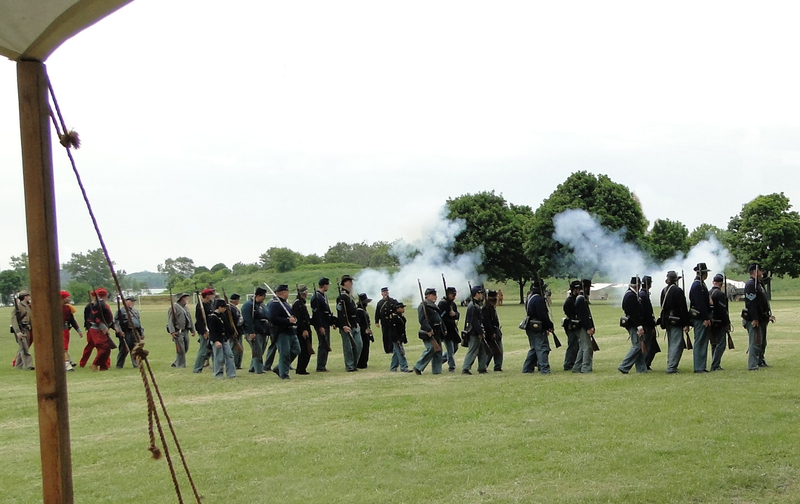 Sunday, however, we had more military show up and the men were able to put on a good skirmish for the visitors. As small as it was, it was put on well by the men, and the visitors certainly enjoyed watching and hearing the guns and cannonading. 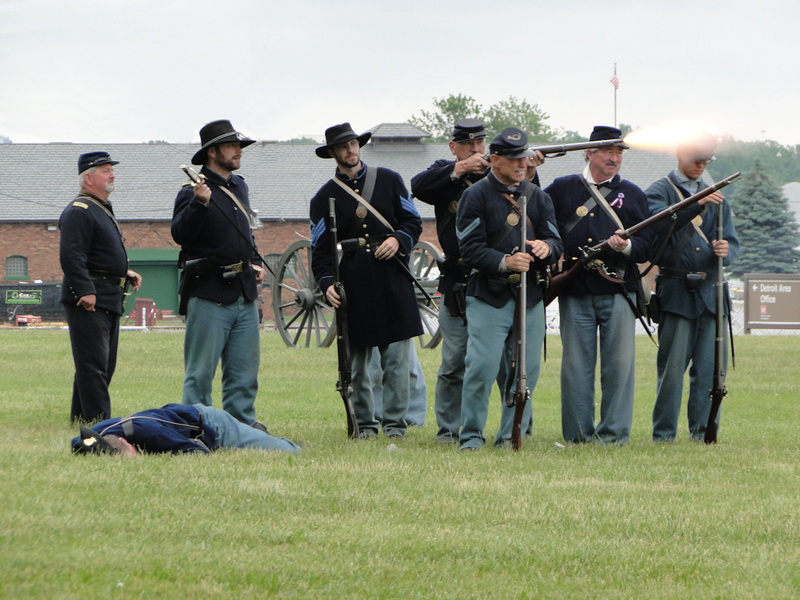 This is one of the few times I have been able to capture the flame shooting out of the barrel of the musket. 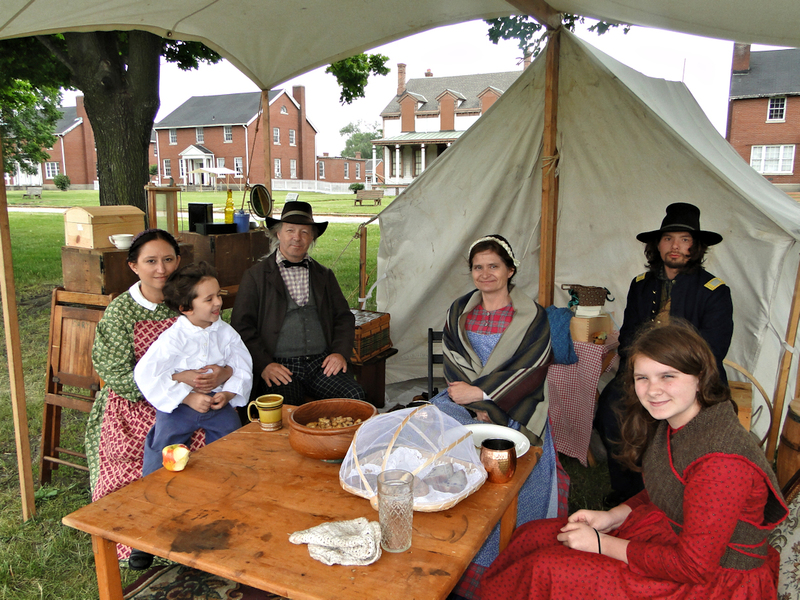 A few of us from the 21st Michigan civilians (and one soldier) enjoyed the time spent together, no matter the weather. 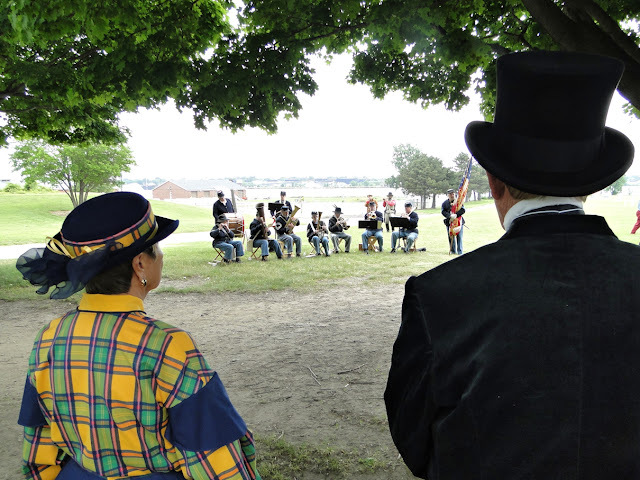 It is a privilege for us to take part in Historic Fort Wayne reenactments, because all monies made goes directly to preserving the fort, the historic buildings near the fort, and the grounds in which it is all located. 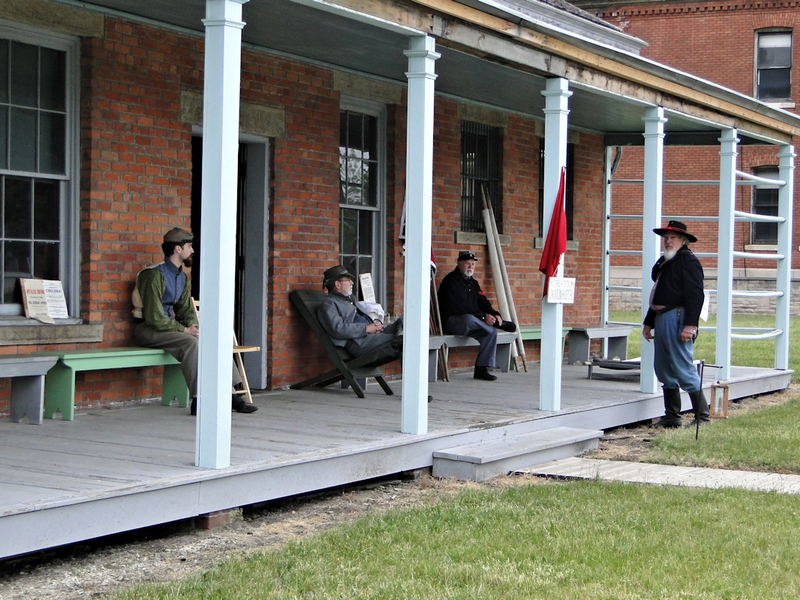 And I will be back at the fort soon, for next up is time spent during Revolutionary War America. 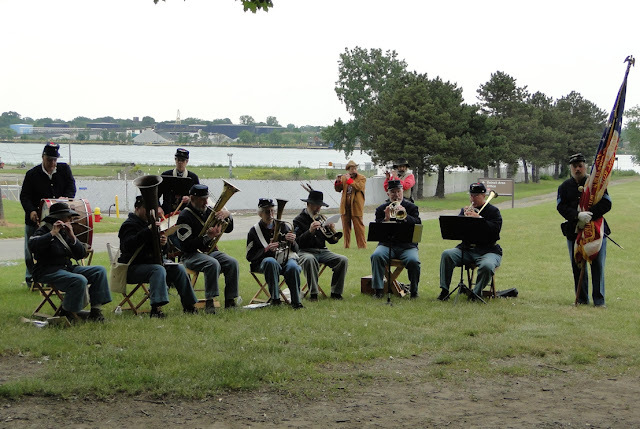 If you are interested in learning more about this important piece of Detroit history, please click HERE. Amazing, thank you so much for taking my picture! 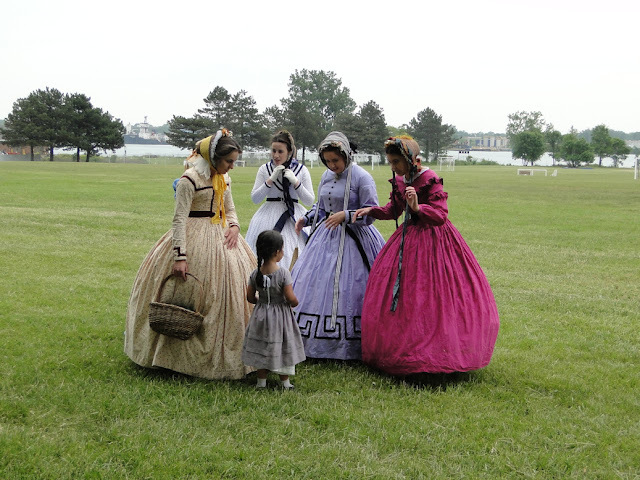 All three are beautiful 😊 It was a wonderful weekend dispite all the rain, glad you were there to document it!